Pac Man - Toru Iwatani, a programmer at the Japanese company Namco created an arcade game that was so popular that it even spawned its own TV show in the US. The arcade version of Pac Man eventually sold 300,000 cabinets, becoming the best selling arcade game of all time. Battlezone – Famous for being the first truly 3-D game, Battlezone (Atari) featured a virtual battlefield considered to be so realistic at the time that a version of the game was used by the US military for training purposes. MUD (Multi User Dungeon) - The first networked multiplayer game went online on a very early version of the internet known as ARPAnet. MUD was a text based adventure game created in the UK two years previously by two students at Exeter University, Roy Trubshaw and Richard Bartle (pictured). Donkey Kong - The first international smash-hit game for Nintendo. Designed by Shigeru Miyamoto, a newcomer who had never designed a game before, Donkey Kong was an arcade game that featured a runaway gorilla and a carpenter called ‘Jumpman.’ He would later change jobs and become internationally famous as the plumber Mario. 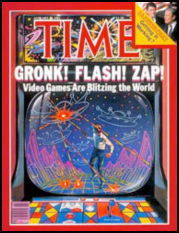 Videogames feature for the first time on the cover of Time magazine. Sega - Sega release its first video games console, the SG-1000. The Sega company (formerly SErvice GAmes) was founded in 1940 in Hawaii. The company built pinball machines and other coin operated games for US military personnel serving on bases in the Pacific like Pearl Harbour. In 1951 the company relocated to Japan. Sega’s most famous game Sonic the Hedgehog was released in 1991.